Lovely links. I think Rachel Coleman is amazing, too. By the way, did you find the info on Sarah Eastman? Look up Suffolk Craft Society dot org and you'll get to her. My links wouldn't work on that post so I scrapped them. Awwwwww...love the teddy. I've been here at the computer cruising and it's nearly 1:30 in the afternoon. I have so much I need to do....like checking out the sites you linked to. Must make myself get some fresh air...I couldn't find a website for Sarah Eastman, does she have one? Have a wonderful weekend. 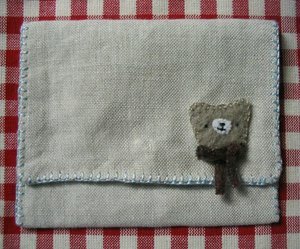 I love your teddy and rabbit wallets so much I made some of my own. I posted about them, too. If you don't look at all those links, you might miss out on something really fabulous. That teddy is so cute! And thanks for yummy links. Wow - fab sites! How dod you manage to find them? Thanks for the links... those Hannah Lamb bags are gorgeous! I know what you mean about spending too much time on the internet: there's so much eye-candy to be seen but not enough hours in the day, I always end up feeling inspired but frustrated that I haven't used the time to make anything myself! Love your teddy wallet! Great pouch and great links! Teddy is adorable, and thanks for the great links! That teddy wallet looks an awful lot like Johnny! Let's not get greedy, eh? i've found myself giddy when i notice you have a new post... everything. always. so fantastic! thanks! Super sweet one, and I know what you mean about too much surfin... ehh.. bye!